While on a trip to Bahrain, I recently read a book called, "Around the World in 80 Scams," by Peter John. It is a book published by Bennion Kearney, and even though it was published in 2011, I found it to be a fascinating and engaging read. I wish I had come upon this book several years ago. The information contained therein could have saved me some money. 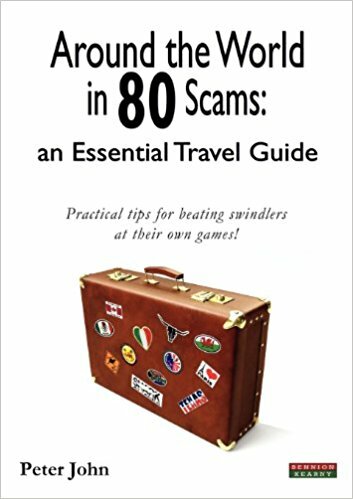 Essentially, Peter John lays out 80 types of travel scams of varying types, common ways they are applied, the countries where they are commonly perpetrated, and the amount of financial damage it can do which is based on a scale of 1-5 (1 being minimal cost, 5 being significant financial damage). Many of the scams described probably have been witnessed by 90% of travelers and expats at some point during their holiday or travels. Some of them are so common that to not see it or have someone attempt it on you would be considered unusual during a vacation or while traveling. While most people would know these are scams, some people obviously still fall for them since they continue to be used on unknowing or ignorant travelers. For instance, there is the classic Three Card Monte scam which most people (travelers or not) know they will never truly win or get ahead of in that game, yet people still play it and loose money, especially if they believe that can beat the dealer at his own game (the traveler cannot). There is also the "free guide." In this scam, which happened to me in Cambodia in 2011, a "guide" in official looking clothes will approach a traveler and start to give a tour of a site without being asked to. At the end of the "tour," the guide will hit up the traveler for a tip even though the service was not asked for. As I read this book, I found myself nodding repeatedly and thinking to myself, "Yep, I've seen people fall for that," and "Yep, I've had that happen to me. How could I have been so stupid?" Reading this book definitely made me think back of all the times I have traveled to different countries and was probably a victim of a scam without realizing it at the time. It was certainly eye-opening but also very interesting to learn about the huge variety of ways people have developed to cheat others. I strongly believe that if these scammers put their creativity to other uses instead of trying to separate people from their money, they could make a pretty good life for themselves. What I liked about this book in particular was that Peter John does not claim to never have been scammed. On the contrary, he openly admits that he has been a victim to several of these scams in the past, and he often shares anecdotes of his experiences along with stories of other travelers he has met who have been victims of the scams. I felt this gave a human dimension to the book, and it made me feel that even the most experienced of travelers still can be victims of scams. In the spirit of disclosure, I will make a confession. I too have fallen for scams. Luckily, in my case, I have never been a victim of a more serious scam, such as someone stealing my credit card information or ATM number or being drugged and robbed which has unfortunately happened to some people. For me, the worst scams that have happened to me tend to be almost exclusively with taxis where the financial damage has been rather minimal but not always. It's been annoying, and there has been more than one time during my travels where I have felt frustrated and angry at myself for letting something like that happen, but it is all part of the travel experience. For a first-time traveler who were to read this book, it could possibly be off-putting and create an aversion to travel, but that is definitely not Peter John's goal. Instead, his goal, as he says in his book, is to want to people to travel and experience the world, but he also wants to create an awareness that these scams do exist and how to spot them. It is an unfortunate fact that as more and more people travel, scammers will always find different ways to change and vary these practices to separate travelers from their money. However, if a person is able to identify when a local is being a little too friendly or if something seems to good to be true, it should deserve a certain level of scrutiny. Travel should be an open learning experience, but naivety when traveling can be foolish and sometimes even dangerous, so while it is important to try and get to know locals and experience the culture, it is just as important to not be too trusting lest you set yourself up for some possible problems. I think many travelers have sometimes allowed too much of an open mind let other nefarious people take advantage of a trusting and curious nature. Ultimately, even though the book is several years old, the wisdom it imparts still has relevance to any travelers whether they are newbies or seasoned. I definitely feel more knowledgeable about what to look for when I travel. I would definitely recommend reading "Around the World in 80 Scams." It will certainly make a traveler or visitor or even a newly-arrived expat more knowledgeable about what to expect and how to avoid being separated from your money.